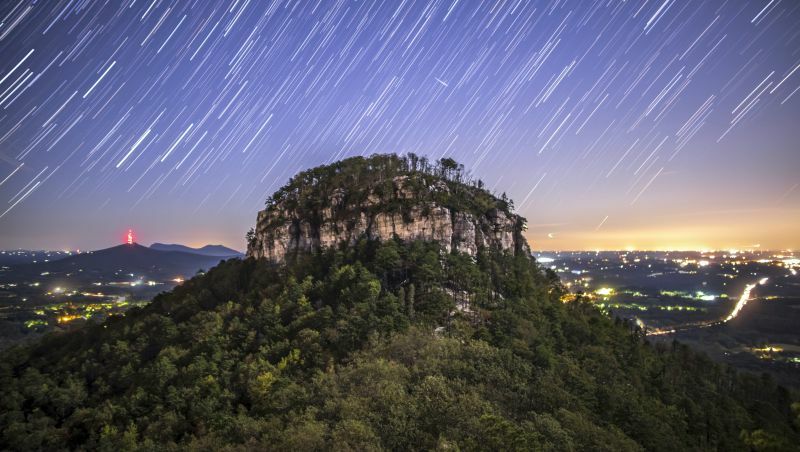 With 41 state parks and recreation areas to visit across North Carolina, you’re never far from stargazing, fishing, camping, horseback riding and rock climbing. Plan an outdoor adventure to one of North Carolina’s beautiful state parks. Test your endurance climbing to the top of a breathtaking peak or sit back in a comfy chair and take in the sights and sounds of a peaceful lake. 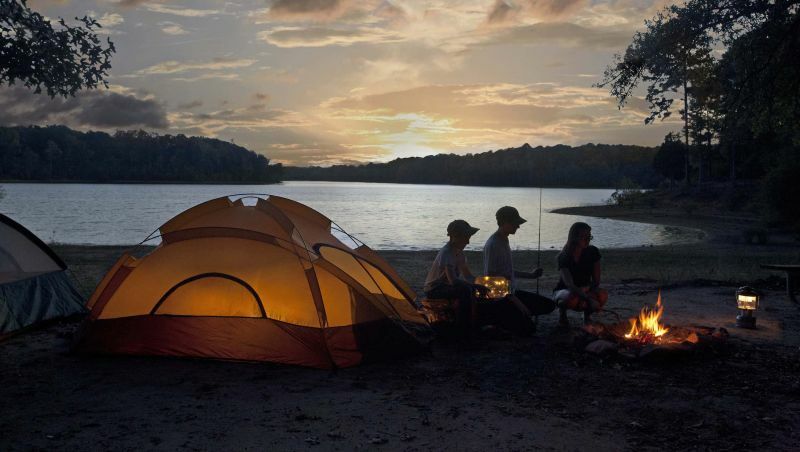 Whether you’re looking for an all-day adventure or an evening under the stars, North Carolina parks deliver. Most of the state’s 41 parks and recreation areas don’t charge admission, and fees for camping, renting a canoe or stabling a horse are reasonable. Built between 1826 and 1834 to guard the entrance to Beaufort Harbor, this 5-sided fort was seized by Confederate troops at the outbreak of the Civil War. 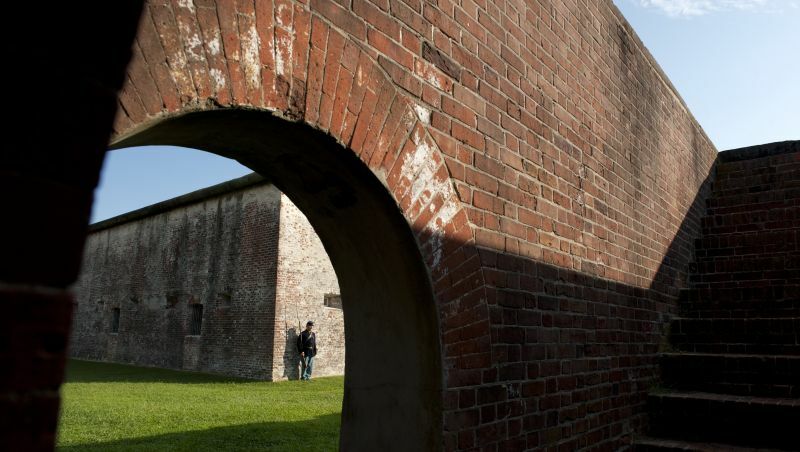 Today, Fort Macon is one of the state’s most popular parks, offering sandy beaches and one of the finest surviving examples of 19th-century military architecture. Stand beside a historic cannon and peer out over the water like a young Confederate soldier on watch, keeping your eyes peeled for approaching ships. Civil War reenactments occur during summer months; call for dates. After touring the fort, go hiking, picnicking, swimming, fishing or take a ride to the nearby Aquarium at Pine Knoll Shores, a must-see stop for kids. Rising more than 100 feet, Jockey’s Ridge is the tallest living sand dune on the East Coast. Here, private instructors teach hang gliding lessons and rent gear to first-timers and experienced gliders alike. 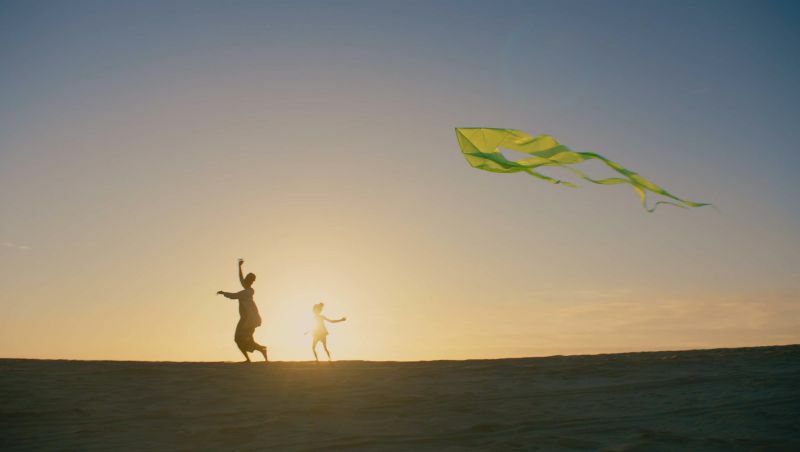 Kite flying, sail-boarding and windsurfing are additional activities that make Jockey’s Ridge a unique experience. Bring a kite or buy one from the store across the street; there are few better spots in the state to enjoy the fine art of kite flying. If flying is your thing, visit the nearby Wright Brothers National Memorial to see the site of Orville and Wilbur’s famed first flight. There are no camping or overnight accommodations at Jockey’s Ridge, but a day trip is well worth the time. 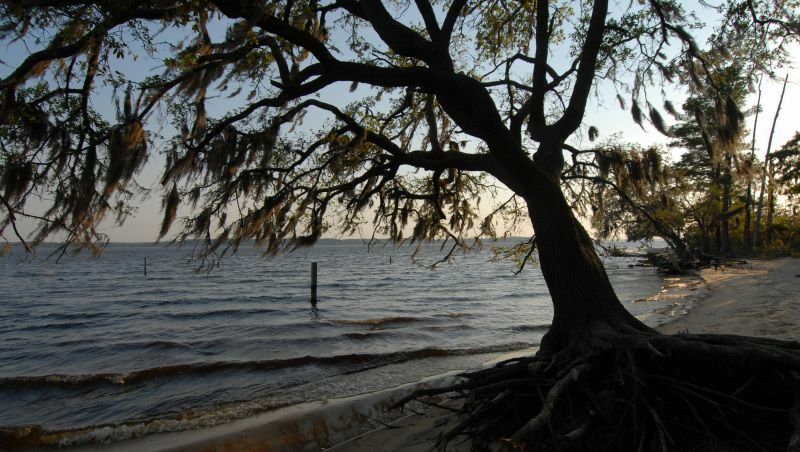 Boardwalks cross over freshwater and brackish water wetlands and lead to an elevated observation deck at this picturesque park located along the borders of the Pamlico River and Goose Creek. 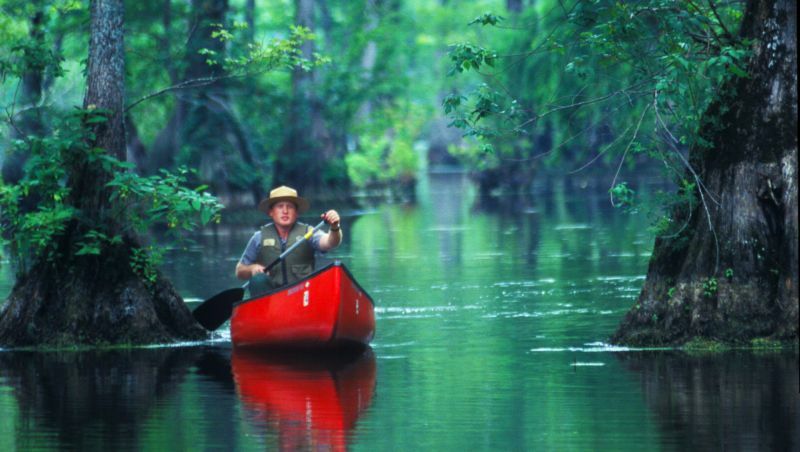 Canoe the broad, unhurried creeks, camp and fish on the shores of the Pamlico or learn more about the wetlands ecosystem. This is a BYOB park, meaning bring your own boat since you won’t find rentals here. If you don’t boat, there’s still plenty to do. Birders and hikers love this spot, too. While you’re here, take detour to the nearby Atlantic Coastline Railroad, c. 1904, one of the largest and best-preserved railroad stations in eastern North Carolina. The depot is home to the Beaufort County Arts Council and the warehouse houses the Washington Civic Center and art gallery. Located in the far northeast corner of the state, 30 miles northwest of Elizabeth City, coastal pond and Southern swamp forest mingle here to create one of North Carolina’s most rare ecosystems. Primitive species of fish and massive bald cypress hung with Spanish moss populate this serene park. Rent canoes or bring your own and glide gently across the dark surface of the millpond. Game fishing is also permitted. Choose from backpack or family campsites, or canoe to your site for a unique adventure. With more than 1,000 family campsites, this park turns into a small town in the summer months. The almost 14,000 acres of clear blue water make it a favorite RV site popular with boaters, water skiers and anglers. Numerous hiking trails show off the park’s natural beauty and offer both leisurely and more strenuous options. 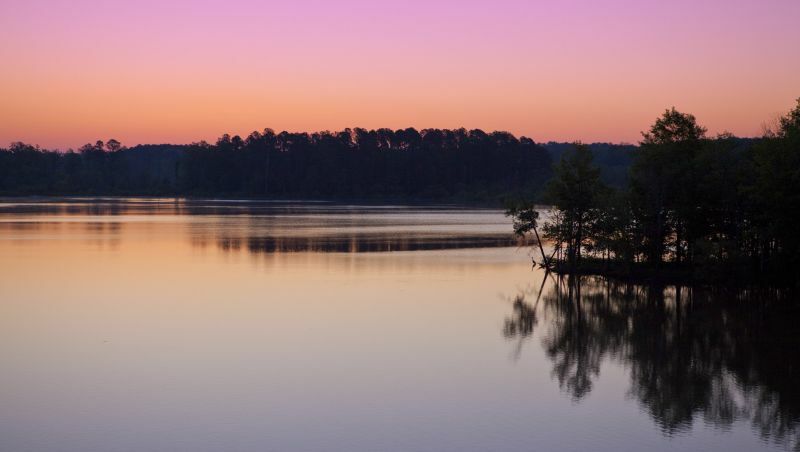 Hot showers are offered in four of the nine camping areas, making Jordan Lake a favorite with families. Nearby Pittsboro offers winery and brewery tours, shopping, dining and more. Or head an hour north to Raleigh, Chapel Hill and Durham for a big city break. Visitors can climb peaks rising 800 feet above the surrounding countryside and watch raptors soar in the wind currents. The park’s 5,054 acres include 1,625-foot Crowders Mountain (with views spanning more than 25 miles) and 1,705-foot Kings Pinnacle. Hike through valleys, across foothills and to the top of these spectacular peaks. Visitors can also rock climb, canoe or fish in the lake. The backcountry campground is reached by trail and is a short backpack away from the parking area. After a day or two at the park, head to Charlotte for some pampering at the Ballantyne Hotel & Lodge’s award-winning spa or hit the greens on the 5-star golf course. Built in the 1930s, this is one of the state’s oldest parks to offer a pool and cabins. Mountains, a placid lake, boat ramp, lake fishing, canoe and rowboat rentals make this an ideal site for a family vacation. Three picnic shelters and 16 miles of hiking trails (plus 15 miles of bridle trails) invite visitors to explore. In addition to vacation cabins, primitive camping and group campsites are also available. 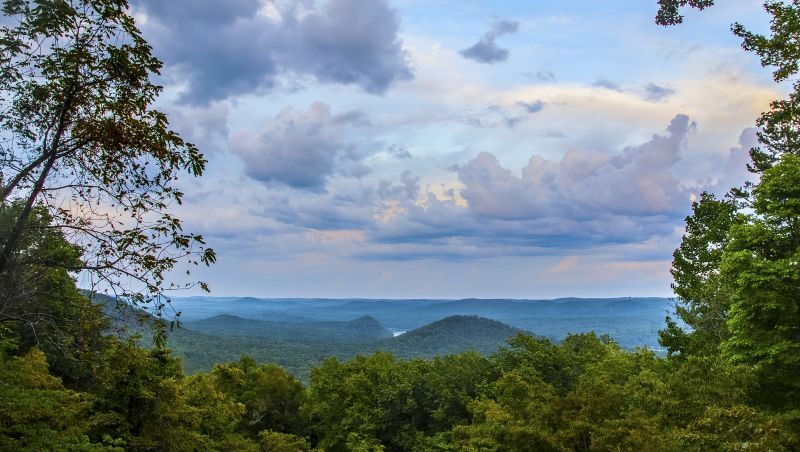 Located along the Pee Dee River and Lake Tillery, Morrow Mountain is about 40 miles northwest of Charlotte. Nestled deep in the woods, South Mountains is one of the state’s most rugged parks. The highlight is High Shoals Falls on the Jacob’s Fork River, where a torrent of water falls 80 feet over a cliff of bare rock. Accessing the waterfall requires a 1-mile hike across fairly rugged terrain, but the sight is truly spectacular. The park is heavily stocked with trout, and fishing is a popular activity here. 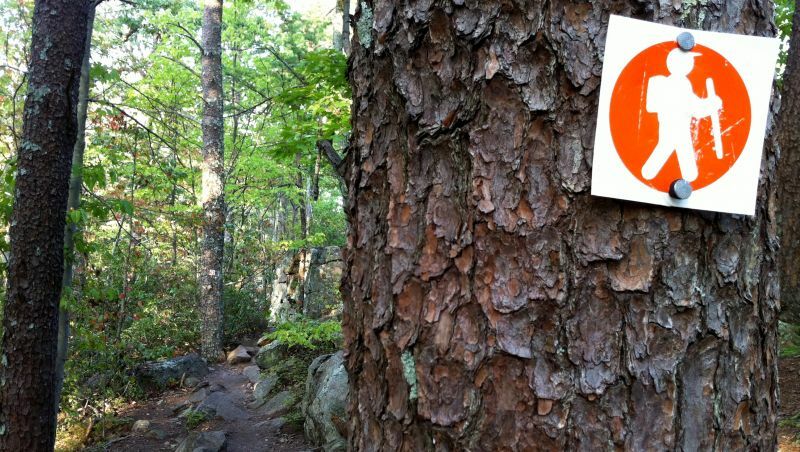 Mountain bikers and hikers relish the strenuous 18-mile loop. Equestrians can bring in horse trailers and camp in designated areas, then hit the trail. 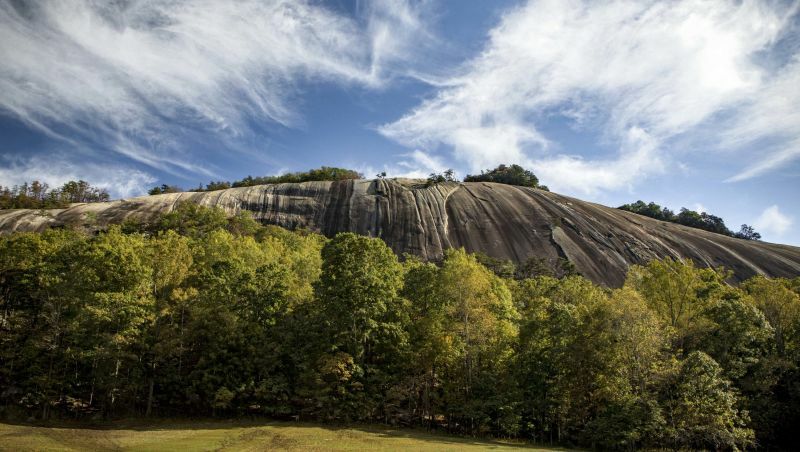 Designated as a National Natural Landmark in 1975, Stone Mountain is tucked in the northwestern part of the state bordering Alleghany and Wilkes counties. The magnificent 600-foot gray-white granite dome offers a challenging experience for hikers and rock climbers, but visitors can get a rewarding view of the face only about 200 yards from the parking area. A restored mountain homestead, complete with log cabin, barn, blacksmith shop, meat house and original furnishing, depicts what the area was like in the mid-19th century. More than 20 miles of park stream are designated trout waters, brimming with rainbow, brown and brook trout. While some viewers thought Andy Griffith’s “Mount Pilot” was a fictional place, Pilot Mountain is indeed real. The park has two pinnacles: Big Pinnacle, a 1,400-foot wall of bare rock covered by vegetation on top is connected to Little Pinnacle by a narrow saddle. Little Pinnacle is a short hike from the parking area and from there, visitors can see for hundreds of miles on a clear day. The main park road is popular for hill climbing by bicycle. Camping, canoeing, rock climbing, fishing and hiking are all available here. With more than 850 miles of shoreline covering 50,000 acres, Kerr Lake is one of the largest lakes in the Southeast. It’s also one of the most scenic. From wooded shores to secluded coves to tranquil picnic areas, Kerr Lake offers something for water enthusiasts and land lovers alike. Fishing, camping, boating, water skiing, sailing, windsurfing, swimming, nature hikes, bird watching and picnicking are all great ways to take advantage of this park’s bounty. In October, take a detour to historic downtown Henderson for an antique and classic car show. North Carolina State Parks offer a variety nature activities, but this also includes potential hazards. Take care, be safe and enjoy. Jason Frye is the author of Moon North Carolina, Moon Blue Ridge Parkway Road Trip and Moon Great Smoky Mountains National Park. He lives and writes in Wilmington.